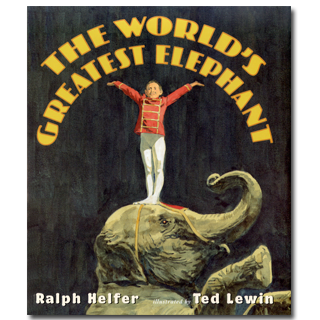 In 2006 Ralph Helfer, wild-animal trainer, and Ted Lewin, known for his realistic artwork for children, teamed up to tell a fascinating story about an elephant. 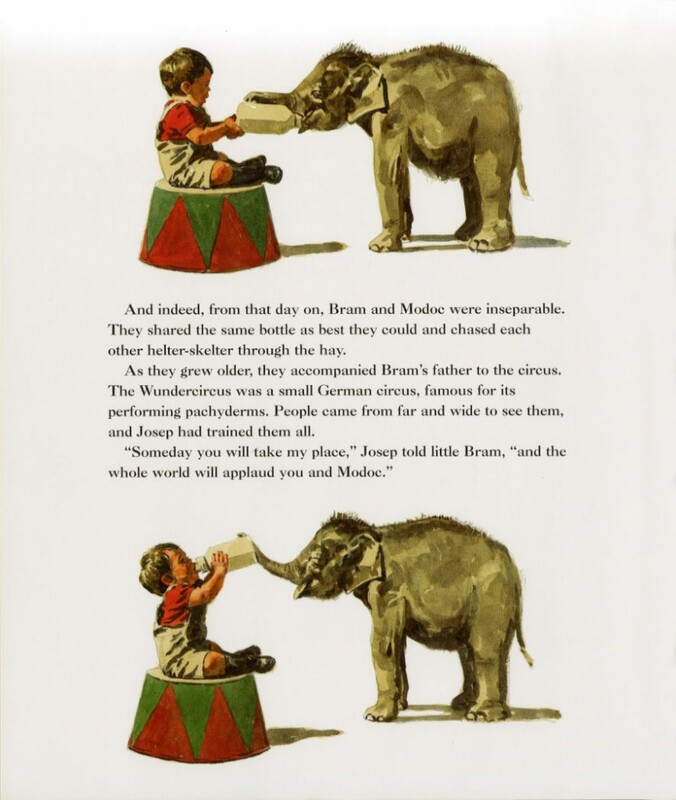 Their book, The World’s Greatest Elephant, features an elephant named Modoc. Almanac readers have already encountered another Modoc in Leda Schubert’s Ballet of the Elephants. In this forty-eight-page picture book with an extensive text Helfer relates a three-hankerchief story about an incredible animal. When she is born in Zezeldorf, Germany, on the same day and almost same hour as the elephant trainer’s son, Bram, the man hopes that the two will always be together. In fact, they become best friends. By the age of five, Modoc weighed two thousand pounds; at ten, she weighed four thousand, making her the world’s biggest elephant. She and Bram perform in the circus together, he a diminutive figure who stands on her head. Tragedy strikes when a new owner named Jay North buys the circus and decides to ship it to New York—but refuses to take Modoc’s trainer. Bram decides to stow away on the boat with his beloved friend. When the boat gets swamped by water, the boy and elephant get separated but find each other in the waves. Rescued by a maharajah, the two friends recover in India. Unfortunately, Jay North has not forgotten about his property, and he gathers up both Modoc and Bram, who come to New York. At this point in the story, readers long for a quiet life for the elephant—because of the trials Modoc has already undergone. But her problems continue. A circus fire scars the giant performer, and North sells her off in the middle of the night. So Bram begins to search for his friend. Narrated by Ralph Helfer, who owned Modoc for the last twenty years of her life, the book celebrates the tenacity of this incredible animal and attests to the wonderful relationship that can exist between a human being and an elephant. And Helfer witnessed this relationship firsthand—he was there when Modoc and Bram were finally reunited. Through Ted Lewin’s dramatic and moving paintings readers also feel as if they witness this remarkable friendship. Modoc comes to life on the page. She dances and performs and trumpets her way through the book. I can think of no better way to celebrate Elephant Appreciation Day than to read this book and discuss with children Modoc’s incredible life story. Originally posted September 22, 2011. Updated for . I used to read, “Stand Back,” Said the Elephant, “I’m Going to Sneeze!” quite a bit. Thanks for the reminder of Caps for Sale, too. I loved that book. In fact, when Carter was reading Give Me Back My Hat in the Publishing and Librarianship class on Monday, it made me think of Caps for Sale. Thanks, Anita. You have selected one of my favorite pictures from one of my favorite books! And…I didn’t know it was Elephant Appreciation Day! Thanks. Can’t wait to check this book out from the library! I love Ted Lewin’s illustrations but had never heard of this book. Your recommendations each day are wonderful! What an incredible story! I’ve seen this book around but never read it. Now I’ll have to take a look. I’ve had the same reaction as Mr. Anderson. I’ll have to go find it myself now. The story of Modoc and Bram is so wonderful to read it is very hard to put down. It is a story that is ever lasting in your heart and mind. The hardships the they go through is so sad, especially for Modoc. The love Bram has for his dearest friend is incredible and for Modoc it is the same. I shall treasure this book always. I have GOT to read this. I learn so much from your almanac, Anita. Ellen: Thanks so much for being a good reader! Very moving story! AND, I’m so proud to own the 2 original illustrations you showed!